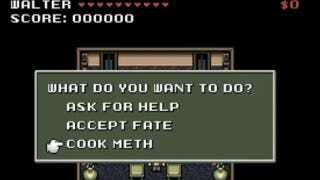 Much in the same way Game of Thrones and Battlestar Galactica have received the RPG remix from College Humor, AMC's "chemistry teacher turned meth cook" drama Breaking Bad has also been given the clever 16-bit treatment. Know that there are extensive spoilers in just about every scene (save the very last one). Yeah, Mr. White! Yeah, science!